Mischief-making Quisling Central, otherwise known as the Australia China Relations Institute (ACRI), is now over two years old. ACRI is headed by Australia’s wrinkliest Quisling, Bob Carr, who assumed that title on the death of the unlamented Malcolm Fraser. The evil that men do lives after them. In Malcolm Fraser’s case, the last bit of evil he did was publish Dangerous Allies, an attempt to get Australia out of its defence alliance with the US. Which, by the way, is the aim of ACRI. What does ACRI get up to? When Senator David Johnston, as Defence Minister, said that he thought that ANZUS wouldn’t apply if China attacked the US, Quisling Central got so excited they brought out an 84 page booklet agreeing with him. Earlier this year Senator Johnston was, for a while, a future consul-general in Hong Kong. He is now No 6 on the Liberal Senate ticket in WA after Chris Back. Hopefully those two will be replaced by the ALA Senate candidates in the West, Debbie Robinson and Marion Hercock. Our highest ranking Quisling, Julie Bishop — Member for Curtin and Foreign Minister — was at the birth of ACRI in May 2014, fawning over the Chinese and so selling out this country. Ms Bishop is also a Double Quisling, selling out Australia in another direction. Arab News (what else would you expect?) 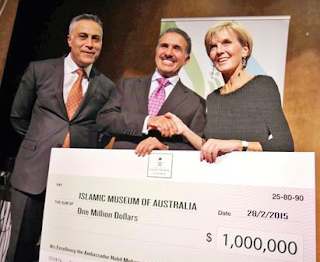 carries a photo of her handling a cheque from the Kingdom of Saudi Arabia to the Islamic Museum of Australia. But let’s not sell her short – she is a Triple Quisling. My sources inside the Coalition party room say that she was as excited as a schoolgirl when the Abbott Government agreed to attend the climate confab in Paris late last year to sell out our interests in that international wealth distribution exercise. Ms Quisling also hasn’t said boo about the homosexual proselytizing that her government has initiated in the nation’s primary schools; by her silence we can take it that she is in favour of it, complicit in what is in effect the torture of our primary school children. Quisling Central has been joined in furthering the cause of Chinese aggression against its neighbours by an outfit based in Canberra called the Australia China OBOR Initiative, the existence of which produces a whole new set of Quislings that one should be aware of. This second outfit is headed by Malcolm Broomhead who is also the Chairman of Orica. In the medium term, with the expected 14 TWh increase in renewable generation to meet the Renewable Energy Target of 33TWh by 2020, combined with continued pressure on industrial demand, wholesale markets are expected to remain oversupplied. In this environment, especially if coal fired generation is retired as a result of the additional renewable energy supply and reduction in industrial demand, wholesale prices are expected to become more volatile as evidenced in South Australia, with periods of very low prices interspersed with periods of very high prices. With an overall short energy and long capacity position and a flexible renewable portfolio, Origin is well placed to benefit from additional renewable energy in its portfolio without stranding existing baseload generation position, while Origin’s peaking generation will benefit from the additional volatility that is expected to result from increased renewable energy. In short, increased legislated demand for renewable energy won’t affect Origin so much because it is short of fossil fuel-based capacity relative to its sales. The violent mood swings expected in power supply as the renewables percentage increases will make Orica’s gas-based peaking plants more valuable. In other words, Origin is setting itself up as a giant parasitic growth on the Australian economy. All this evil is facilitated by the last dark deed of the Howard Government — the National Greenhouse and Energy Reporting Act of October 2007 (NGERA). When the Abbott Government announced soon after it was elected that the NGERA was not going to be repealed, alarm bells went off. If you aren’t going to have a carbon tax, what would be the point of retaining the auditing basis of the carbon tax? All was revealed recently by Alan Kohler – the carbon tax wasn’t dead, it was merely resting and will be back with us from 1stJuly. All those who claimed that the repeal of the carbon tax was a triumph of the Abbott Government were fooled. The man himself may not have known or cared what was really going on in his government. The day after the 1st July start date for the re-incarnated carbon tax is the next federal election and the opportunity to set things right. If the candidates for your federal seat and the senate do not know of the existence of the NGERA, they are most likely to be quite stupid. If they know of its existence but don’t want to repeal it, then they are certainly quite evil. (Ed - emphasis) Both the Liberal and Labor parties are in favour of retaining the NGERA and what flows from it, which is poverty and despair. If you love Australia there are many reasons why you can’t vote for either of them. One of the most authentic voices standing in the next election is Angry Anderson, who volunteered as master of ceremonies at a number of anti-carbon tax rallies during the regime of the Witch. Angry chose the ALA as the vehicle to apply himself through to turn this country around. The ALA is our last, best hope. Why would this website, lend support to the wishy-washy, climate & energy policies of ALA when the climate and energy policies of One Nation are far superior? I note that One Nation's climate and energy policies are also much more aligned with those of the former Climate Sceptics Party. ALA seem more concerned about Israel than Australia's climate, carbon tax / ETS & energy debates. Did you read the full piece , Bill? Read from "All this evil is facilitated by the last dark deed of the Howard Government ...."